Disclaimer: This article contains minor spoilers! Watch Out! Disney really came back with a bang in this well received animated comedy that has not only touched my video game loving soul but filled me with happy nostalgia! I went to see it at the end of February this year and enjoyed it so much that I went back to see it two more times. So now I'm rather pleased to say that it is now available on DVD and Blu-Ray! When Litwak's Arcade closes at night, the arcade machine characters comes to life (kind of like an arcade game Toy Story). 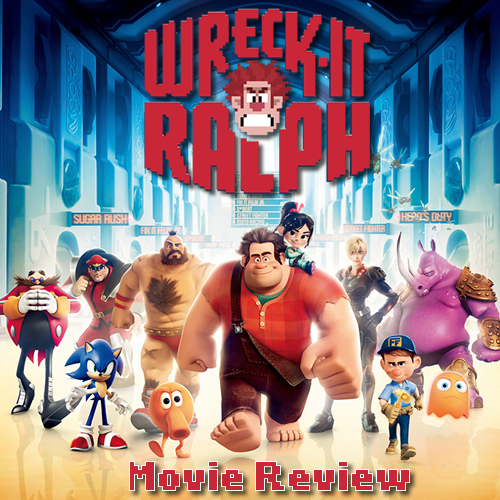 Wreck-It Ralph is the Donkey Kong-like villain in the fictional arcade game Fix-It Felix, Jr. People who play the game love Fix-It Felix, Jr. but loathe Ralph. This has been going on for 30 years and ya know what? Ralph is sick and tired of everyone treating him like the bad guy when he's not actually a bad guy really! This encourages Ralph to journey through several arcade games so he can prove to everyone he is really a good guy, but his intentions will soon lead to chaos for his game and every other game! The beginning of the movie is narrated by Ralph himself explaining his feelings and his life. Once the arcade owner locks up, all the arcade characters check if the coast is clear before coming to life and proceeding to travel to other arcade games. When characters move from one arcade game to another, they do so via a train-like system that transfers them through the cables of the arcade machines to where they want to go. This was a really clever idea and the fact that 'Game Central Station' is the plug box powering all the arcade games is simply genius. What made this film so exciting for gamers like myself, is that it was jam packed full of video game character cameos. 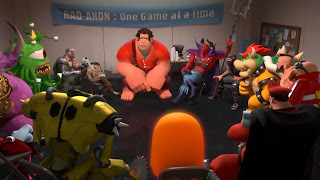 Throughout the film I noticed such unforgettable gaming icons like Sonic, Q*bert, Chun-Li, Pacman, Clyde the orange ghost from Pacman, Bowser, Doctor Eggman,, Ryu and Ken... the list is endless. One weird yet sort of funny cameo in the film was seeing Skrillex at Fix-It Felix, Jr.'s party. But the film does have its own selection of original characters to love as well. Jane Lynch was hilarious in her voice acting role as the tough Sergeant Calhoun in Hero's Duty (an alien first person shooter game) and Sarah Silverman was the voice of the adorable Vanellope von Schweetz who was responsible for driving Ralph crazy during his adventure. Oh, and let's not forget the main man John C. Reilly for his fantastic performance as the loveable Ralph with his massive fists (that remind me of Hellboy's whammer). Each character was funny, sweet and adorable especially Vanellope and Ralph whose chracter designs both look similar to how their voice actors look in real life. The way some scenes were shot was really accurate and faithful to the original games, jumping from 2D to 3D, depending on what game was being shown in that particular scene. I felt like I was watching a real video game come to life before my eyes, rather than just watching a movie on a cinema screen. It was interesting seeing some of the 2D arcade game worlds come to life in 3D. The whole concept of travel between arcade games gives our favourite classic arcade games a whole new depth. One thing I must say is that there are two arcade games shown in the film in particular which I think were included to attract both male and female viewers to the film. One arcade game, Hero's Duty, I feel was included to win male viewers over while the arcade game Sugar Rush, was included to win over female viewers. I feel that during the sections aimed at one particular gender, the other gender may not feel as interested. However, I didn't mind it so much. Also when it comes to Skrillex's music being included, younger kids, parents or elders may not really appreciate the dubstep and find it tougher to understand compared to the rest of the music played in the film in my opinion (personally I really like his track 'Bug Hunt', which I personally think is his best ever track). Despite what I said, I found the majority of the music in Wreck-It-Ralph was really enjoyable. The soundtrack included a good mix of music from chart songs (like Rihanna's 'Shut Up and Drive') to dubstep to 8-bit video game music. Discovering that Owl City sung a song for the film put a wide grin on my face just as I thought the fun was over, even though I probably would've seen it coming, considering he previously made a song for another animated movie, Legend of the Guardians: The Owls of Ga'Hoole. Anyway, I personally believe this film is one of the best Disney films to have come out recently, besides Tangled. This film is definitely worth a watch if you are a fan of video games or Disney films in general. I will now leave you with what I personally feel is was one of the funniest scenes in the film!